As many Midwesterners know from the recent polar vortex, the frigid winter months can bring terrible and dangerous weather conditions. The hazardous winter weather increases the risk of car accidents, frostbite, hypothermia, carbon monoxide poisoning, and heart attacks. Thankfully, you can find warming centers in cities across the United States; mainly those who suffer the most from the cold weather. Learn more about these warming centers and how they’re helping Americans survive the brutal winter season. 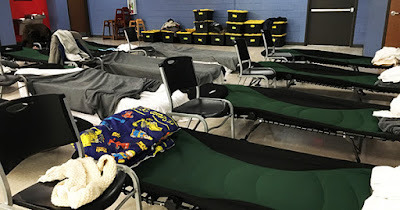 Warming centers are emergency shelters created to serve those who left without heat when the weather gets alarmingly cold. Typically, the government will call a state of emergency when the combination of dangerously low temperatures, precipitation, and wind chill becomes harmful. This is when warming centers begin to act, offering a safe place to those who are unable to escape the dangerous weather. You can find these warming shelters in many cities and towns in areas of the U.S. which suffer from terrible winter weather. Usually operating out of local police stations, libraries, senior centers, and schools, every facility offers a place to sleep, food to eat, and other essential goods to help disadvantaged individuals endure the cold. City officials, social workers, and volunteers are the most common individuals operating warming centers. While these short-term shelters do their best to accommodate everyone through flexible operating hours and other resources, it’s still recommended that visitors bring disaster supply items to help make their stay more comfortable. Warming shelters are a safe haven for those who are without a safe place to stay when dangerous weather strikes. If you find yourself in a situation where you need one of these local shelters, do a quick online search, call 2-1-1 or 3-1-1, or text SHELTER and your zip code to 43362 via FEMA to find a center near you. You may also find help from driving services like Lyft and Uber who have been known to transport those in need to the facilities as well.